Here is another card I made using one of the Whiff of Joy sentiments (Winter Love collection). Please have a look at Kim Costello's blog. You might remember that I featured her as a Yaob Sunday crafter on my blog a few weeks ago. Two of her Whiff of Joy cards have been published in a British magazine! Way to go Kim!!! Bitte schaut auch mal auf Kim Costello's blog vorbei. Einige von euch erinner sich vielleicht daran, dass ich sie vor wenigen Wochen als Yaob Sunday Bastlerin bei mir vorgestellt habe. Zwei ihrer Whiff of Joy Karten wurden jetzt in einem britischen Magazin veröffentlicht. Herzlichen Glückwunsch Kim und vielen Dank!! Paper: Basic Grey, SU cardstock "kraft"
Ich find deine Karte absolut toll!! Sie schaut so edel aus...die Farben sind so schön zart. Looks as though you have pricked on leather. beautiful card. I love the piercing on here. This is just stunnging. Love the layout and colors. Katharina I totally I agree with you...I also want some craft time! :0) Your card is beautiful...and I love the piercing! Gorgeous! The Mariah Carey "All I Want For Christmas Is You" is my ultimate favorite christmas song so I love your sentiment stamp! Beautiful card! Love the Piercerabilities look. havn't played with those myself. Love the pierceability die, looks inpressive. A great card! Love this - my friend led me back into doing some paper pricking recently. 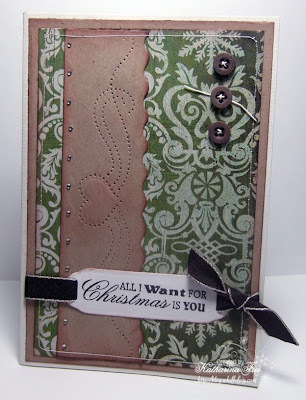 I didn't know Spellbinders had brought some dies along this line - I must have a look. Love what you have done with the die. LOve the card, the leather look is ace! Just wonderful. Great colors & design. Great job. Hi Katharina, die Karte sieht total edel aus! Diese Spellbinders iercerabilities kenn ich noch garnicht. I think this card is REALY beautifull!! Very delicate.